In coastal California dune ecosystems protect coastal cities from damaging storms and provide habitat for native wildlife. Despite the economic and ecological importance of coastal dunes, habitat loss has continued and is predicted to accelerate with a changing climate. To combat the effects of climate change and ensure that coastal dunes will persist into the future, they need to be prioritized for conservation and restoration. However, for restoration to be successful, endemic plants, which are plant with specialized habitat requirements, need to be prioritized because they make up a significant portion of the biodiversity in California coastal dunes. Because endemic plants are rare and there is limited stock of plants available for transplant, we need to be more aggressive in using pilot studies. These can be used to evaluate the biotic and abiotic conditions that maximize growth and reproduction and to help guide effective reintroduction. To evaluate how exploratory pilot studies can enhance the restoration of rare and endemic plant species, we conducted a study restoring Lupinus nipomensis, a United States federally endangered species, on coastal dunes in San Luis Obispo County, California. We found that L. nipomensis had the highest seed production in plots that had a steep, north facing slope and were protected from herbivores. Our results suggest that restoration efforts should be focused on areas with these characteristics to maximize restoration success. Our pilot reintroduction of L. nipomensis highlights the importance of using pilot experiments to enhance reintroduction success and to quicken the recovery of coastal dune ecosystems. This study was performed by the University of California, Santa Barbara Cheadle Center for Biodiversity and Ecological Restoration in cooperation with United States Fish and Wildlife, Ventura Field Office and the Land Conservancy of San Luis Obispo. We thank Connie Rutherford, Lindsey Roddick and Jon Hall in collaborating with us on this project. We thank all the people who assisted in the field, Ra’am Akiba-Hajim and Patrick Turner who dedicated a large amount of their time as volunteers. We thank the undergraduates in the D’Antonio lab at UCSB for processing and analyzing soil samples. 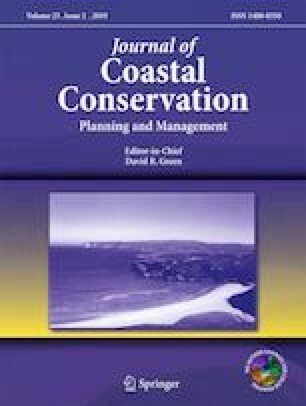 We thank the anonymous reviewers for the Journal of Coastal Conservation in providing valuable feedback in improving this manuscript. This study was funded primarily by the United States Fish and Wildlife Service, Ventura Field office with additional support from the Cheadle Center for Biodiversity and Ecological Restoration. The authors have no conflicts of interest.